In a deep baking dish, add 1 tablespoon of olive oil and brush on the entire bottom of the dish. Place the Cod Fillet in the dish until ready to use. In a small bowl, combine ½ cup of chopped parsley, 1 teaspoon of garlic powder, 1 teaspoon of ground pepper, 1 teaspoon of salt, the zest and juice of 1 lemon, and 3 tablespoons of olive oil. Brush the top of each fillet with the mixture. In a separate bowl, combine 1½ cup of bread crumbs and ½ cup of ground almonds and press down to coat the top of the fillet. Bake until firm, about 15 to 17 minutes. 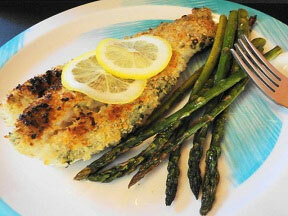 Serve with lemon wedges and your favorite vegetable.